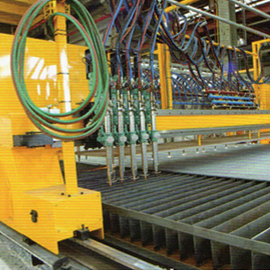 The ArtMax-03 flame cutting machine is a cost effective system for making straight cuts (strip cuts) in steel plates. The overall size and number of torches are configured according to the requirements of the customer's application. Several gas torches mounted on the front of the machine can make longitudinal straight cuts simultaneously, and one torch mounted to the back of the machine can make crosswise cuts to cut off the width edge of the plate. The simple operator console makes it easy to control the cutting process. Optional features such as manual or motorized height adjustment support the ability to raise and lower all torches together for convenient operation. Water spray devices are also optional.